Every year hundreds if not thousands of people who have never been here come to the White Mountain National Forest to hike. For some they discover the trails and see how accessible our mountains appear to be while here for another reason, while others come here specifically to hike knowing the area’s reputation for stunning natural beauty, often not realizing that the trails can be really challenging. Sometimes these folks find themselves drawn to these mountains after their initial exploration — because the “mountains are calling” as John Muir was known to say — and return to the area to hike some more. 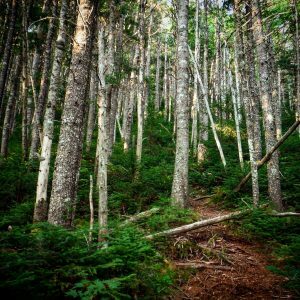 Some learn about the New Hampshire 4000-footers, learn of our “list,” and many of those folks decide to try to hike them all. And so it begins. A phenomena we’ve witnessed time and time again. We were there once, and thus we have learned a few things along the way. If you’re starting out, here are some helpful tips. Buy a map and do get a guidebook. The AMC White Mountain Guide and its maps are a good place to start covering pretty much all there is. Another fine choice is the book “Hike the 4000-Footers of New Hampshire” which really focuses on the 4000-footers. (The latter title was written by Steve Smith and Mike Dickerman, both editors for the AMC’s book.) Without a map and some basic information about the trail and mountain you’re on, you’re setting yourself up for failure, or worse. Make sure you’re properly prepared for the day, and beyond. From what you wear on your person (no cotton clothing, for example) to what you bring with you like warm layers and a proper working headlamp, just to name a couple of the “Thirteen Essentials.” It’s all pretty important. When hiking one must consider the possibility of staying in the mountains longer than expected and be prepared for this eventuality. One common problem we see a lot in search and rescue is people going it alone (or groups splitting up). Which is never a problem until something unexpected happens, such as a minor injury. Even a simple twisted ankle can be a big problem when you’re miles from the safety of the trailhead. A delay is inevitable. This is why we gear up right. See above. Can’t find someone to go with you? There are clubs and groups all over than might help, some offering safe, quality experiences. You can also hire a trained mountain guide as insurance. Try not to push yourself beyond your physical or experiential limits. Perhaps at the gym you can work yourself half to death and crawl to your car afterward, but that’s not so easy in the mountains. You need to have reserves. For safety. This is also true of protecting your joints. Work up to those mega traverses and monster loops. Your muscles will get very strong partaking in this popular low-impact sport and given time you might be able to accomplish great things. It is said that the mountains will be there another day. Thus, if weather closes in — which can happen with frightening speed in the mountains — or the hour is getting late, or you’re simply not feeling 100%, turn back. Come back another day. Don’t succumb to “summit fever” where you find yourself driven to reach the summit no matter what the costs are. Trust us when we say the costs can be very high. Too high, in fact. We know, we’ve heard it before, you’re only going to hike the 4000-footers, in summer, or some other simple list, then you’re going to stop. Quit. Retire. Peakbagging is silly. But then you’ll hit the end of that list and realize you don’t want to stop. There are other lists, other trails, a lot more to see: the Winter 48, the 52 With A View; the New England 67, the GRID; the Terrifying 25; Redlining, the Hundred Highest, the 3000-footers, 200 Highest, just to name some. Keep track now, record details and dates, and make sure you explore every tiny spur trail. Who knows when you might “need” it. Enjoy the experience to the fullest. We’d like to tell you to slow down and smell the flowers along the way, so to speak, but there is a overriding sentiment that will prevent us from doing so and that is HYOH — hike your own hike. If you like speed and challenge, go for it. If you like to dawdle, then go for that, instead. Enjoy the mountains to the fullest extent in whatever manner you see fit and don’t let anyone tell you you’re doing it wrong. That said, when it comes to safety and preparedness, if you go forth with obliviousness and disregard, you could find yourself… well, let’s just say up a certain creek without a paddle, to paraphrase yet another saying. And do consider this: your actions may affect others (i.e. search and rescue) and there can be financial consequences. Ignorance is not a valid excuse (though Hike Safe Cards are accepted).